FLOWERY BRANCH, Ga. (AP) — The Atlanta Falcons picked a bad time to play their second-worst game of the year. Losing by two touchdowns at Cleveland cost the Falcons (4-5) a chance to move one-half game back in the NFC wild-card race. They enter this week’s home game against Dallas (4-5) two games behind Carolina for the final playoff spot. Atlanta looked out of sync most of the day. Only in Week 5 in a blowout loss at Pittsburgh did the Falcons play worse, but quarterback Matt Ryan isn’t terribly concerned. Trailing 14-10 and getting the ball to begin the third quarter, Atlanta’s next four possessions ended with a fumble, two punts and a failure to score from the 1-yard line early in the fourth when Tevin Coleman was stopped for no gain and Ryan threw an incompletion. 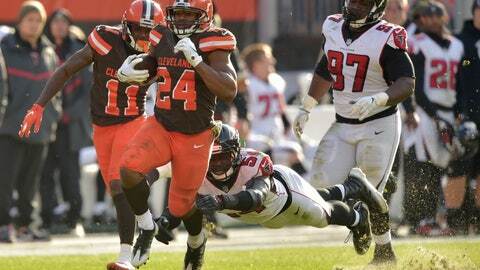 In between, the Browns scored two touchdowns with Nick Chubb’s 92-yard run, the longest in Cleveland history, one of the most embarrassing plays of the season. Linebacker Duke Riley froze and got blocked by center JC Tretter while right guard Kevin Zeitler pinned Derrick Shelby back at the line of scrimmage. Chubb dashed through the hole and was too fast to catch after free safety Damontae Kazee dove at his feet and whiffed near the Cleveland 22. The Browns’ 211 yards rushing were the most Atlanta has allowed since Sept. 28, 2014, at Minnesota. The offense suffered a letdown when center Alex Mack sent a shotgun snap over Ryan’s head in the second quarter, causing the Falcons to settle for a field goal. Mohamed Sanu’s lost fumble to begin the third was even worse because he held the ball out to get an extra yard and was still 14 yards shy of the first-down marker. Six plays later, the Browns were dancing in the end zone. Quinn will challenge his players to create more energy in practice this week. “I thought over the last couple weeks defensively we knew we had faced some good runners with the Giants and certainly at Washington, and it was going to take that second and third guy jumping over the pile to get there,” he said. “I thought offensively we’ve been hitting it on that stride for a few weeks now. Notes: Quinn said MLB Deion Jones will practice for the second straight week in hopes that he can play against the Cowboys. Jones has been out since breaking his foot in the season-opening loss at Philadelphia. … It will likely be Thursday before Quinn knows if kicker Matt Bryant will be ready to return from a hamstring injury. Giorgio Tavecchio is 5 for 5 on field goals and has hit all eight of his extra-point tries in playing the past three games in Bryant’s spot.